The effectiveness of email marketing heavily relies on the number of emails that get delivered into the inbox folder of your subscribers. Having a great creative, design, and call to action would make no difference if you have poor deliverability rate. To get the opens and click-through rates you are aiming for, you ought to have good email deliverability. Average global inbox placement increased to 85 percentage points in 2018 while compared to 80 percentage points in 2017. This has led to the overall enhancement of email deliverability. However, the biggest blasphemy is that even if you are sending permission-based emails, your messages could end up being undelivered because they triggered a spam filter. An important aspect of your email sending infrastructure that affects deliverability is reputation. Therefore, it is incumbent upon the marketers to keep an eye on the bounce rate and sender reputation. However, it is quite likely that your sending IP address gets blacklisted even if you follow all the email marketing best practices. So, what is an email blacklist? Email blacklists refer to a list of IP addresses or domains with restricted access into a network. Once your emails get blacklisted, you will observe a considerable increase in the bounce rate. This is because your emails will not make it to the inbox and end up in the spam folder. Ultimately, it will cripple your email deliverability and make your email marketing efforts go in vain. While there are several blacklists on the Internet, you should be wary about the five blacklists enlisted below. If your IP shows malicious behavior like spam bots, open proxies, dictionary attacks, you are likely to get listed on this list. A number of hackers run dictionary or open proxies once they hack the websites. In case they happen to hit the servers under the scrutiny of CBL, the IP will be included in this list. But, you can easily request the removal of an IP address listed here. The SBL uses spam traps like email addresses that are not owned by real people. If the emails that you send land in an SBL spam trap, your IP will get added to this list. You will have to use to Spamhaus Blocklist Removal Center to understand the removal process as it depends on the list (SBL, PBL or XBL) you are included on. You will find hijacked IP addresses in this list. It includes more of PCs rather than servers. IP addresses of servers used as a spam gateway get listed in the XBL. Like SBL, you must use Spamhaus Blocklist Removal Center for removal of the IP. Spamcop determines a reputation score by using spam traps and spam reports. The score is generated by weighing the spam reports against the reputation points. If you find your IP in this list, you must check for security issues on your website. Spamcop will automatically delete your IP within 2 days after the spam source is brought under control. Like Spamcop, your IP in this list implies a breach in your website security. You can find the list on BarracudaCentral. It identifies spam sources through spam traps, honeypots and similar systems. Removal from this list is the easiest as you just have to fill up their removal request and your job will be done in a day. Once your IP gets blacklisted, your email will no longer make it to the subscriber’s inbox but to the spam folder. This will, in turn, hamper your email deliverability and render your email marketing strategy ineffective. Here are some tips that can help you stay safe and keep clear of spam complaints. Sending emails to purchased lists invites spam complaints like nothing else. You should send emails only to those subscribers who have granted you permission through a double opt-in method. With the implementation of strict anti-spam laws like CAN-SPAM and GDPR, it has become all the more important to obtain explicit consent from the subscribers before sending any emails. Write subject lines that can not only capture the reader’s attention but also convey what the email is about. Although it is tempting to write “Re:” or “Fwd:” to grab the instant spotlight on the subject line, we do not recommend that practice as it can vex your subscribers into marking your email as spam. Instead, draft a well-thought subject line that matches the email copy and entices the recipient to open the email. Take a look at the example by Moo. The subject line, as well as the email copy, are perfectly in sync with each other. 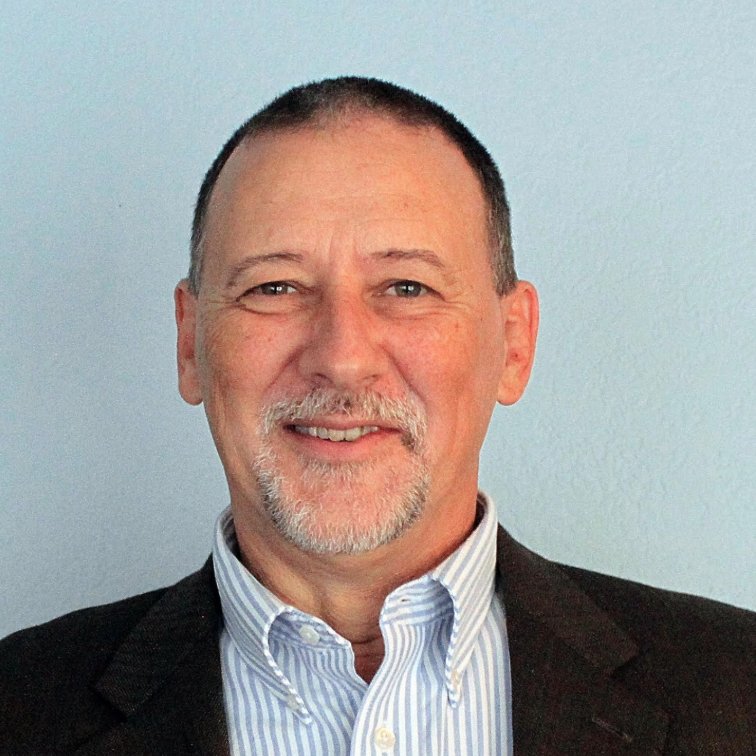 Mass emailing no longer work in today’s competitive marketplace. 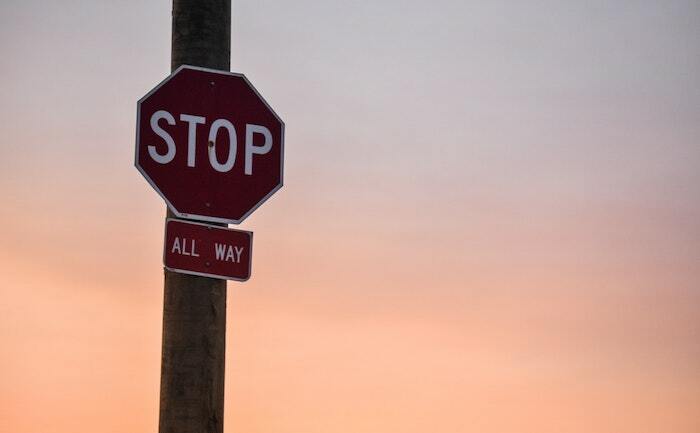 Your subscriber’s inbox is flooded with tons of marketing emails and if your email fails to stand out, it might get marked as spam and ultimately your IP gets blacklisted. Therefore, you should send personalized emails that are aligned with the buyer’s journey. Send triggered emails based on the subscribers’ activity to deliver value to them. After all, relevance is key to modern marketing. 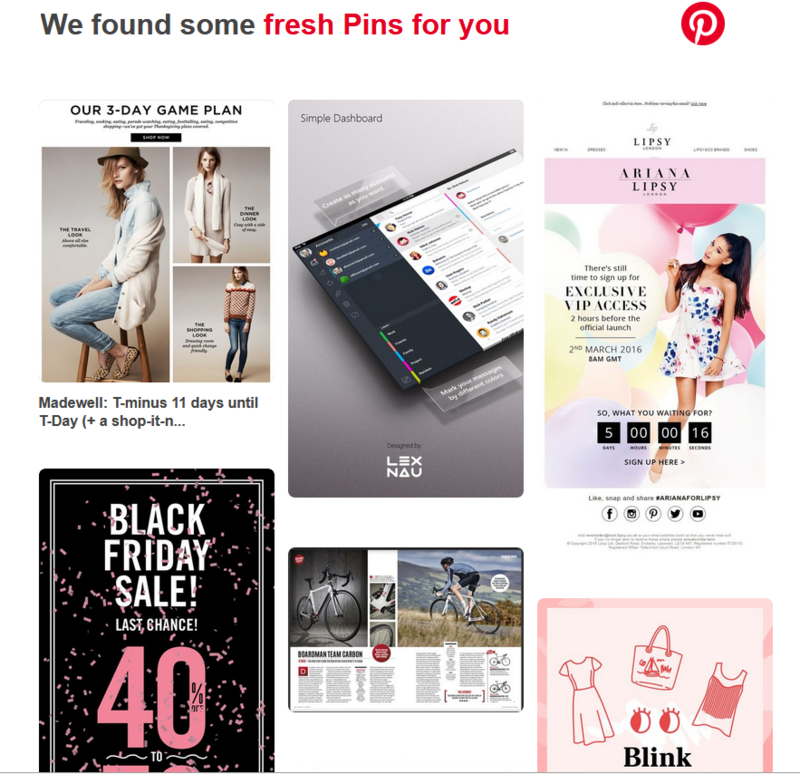 See how Pinterest personalizes the email for me (because I keep searching for email design examples all the time). An unsubscribe is better than a spam complaint. According to anti-spam laws, it is mandatory to have an unsubscribe link in every email. Missing out on this link can trigger the spam filters and weed out your email. Additionally, once someone unsubscribes from your email list, make sure you remove his/her information from your database. The email example by FLIR Systems, INC has no unsubscribed link. Of course, they have included a link to update email preferences but that is not enough. It is a must to have an Unsubscribe link, according to the anti-spam laws. 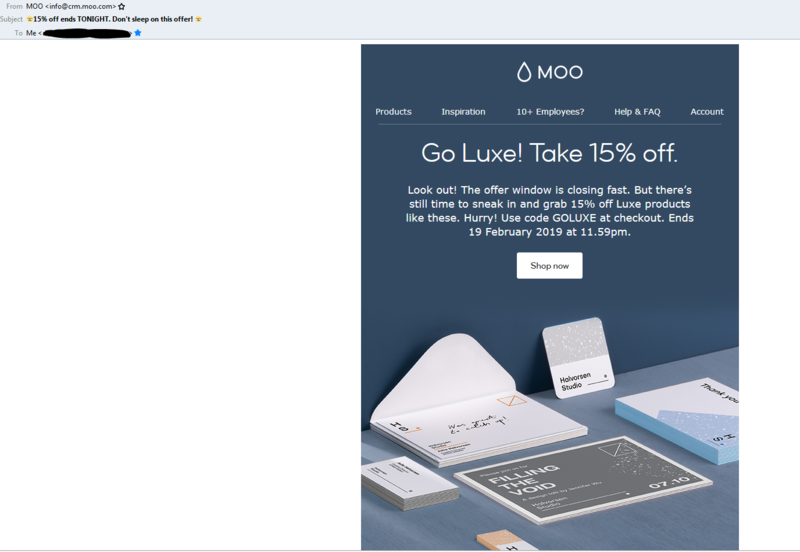 In the quest for designing attractive emails, you should not overdo it. Flashy emails with bold colors are instantly caught in the spam filters. Use a subtle call-to-action in contrasting color that is not too loud for the reader. Also, remember that you should follow the branding guidelines to build a credible brand personality and ensure the right brand recall for the subscriber. Check how Travelocity has consistently maintained the same font style, colors, and brand logo in their emails. Whenever you send an image-based email, do not forget to add the alt-text so that it informs the reader what the email is about even when the images are turned off. 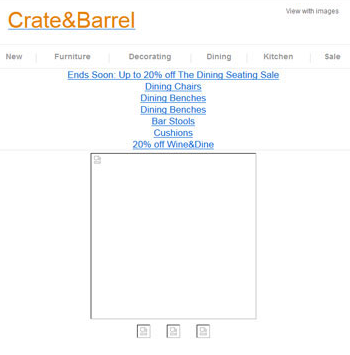 Here’s an example by Crate&Barrel. According to the overall length of the email, keep the text to image ratio at 80/20 so that it stays away from blacklists. The way your emails are coded has a huge impact on email deliverability. You should never copy-paste codes directly from Microsoft Word or Frontpage as it adds extra tags to the HTML email. Such a poorly coded HTML triggers the spam filters. Remove any additional nesting table and make sure that the email size does not exceed 30kb. A broken email layout is considered to be spam triggering factor, so always test your emails for any rendering issues across the diverse devices and email clients. Check your email content for spam through software tools like MailingCheck and IsNotSpam. In case you receive an alert, make the prescribed changes before sending out the email. Take a look at MailTester’s blacklist report. Based on this report, you should re-check the body of the email and the URLs included therein. Always check for grammatical errors and make sure that there are no shortened or broken links lest it lands your email in the spam folder. Many marketers have the concern that their email bounce rate is too high and the emails do not make it to the inbox folder. If you are one of them, these tips will surely help you draft better emails and improve your email deliverability. Just maintain a strong sender reputation, a clean list free from any invalid addresses or unsubscribes, and send valuable content; and your subscribers will certainly look forward to receiving more of your emails.